We made it to Pensacola but it wasn’t all smooth sailing. Saturday night there had been some thunder storms in the distance and as I was about to grab a short nap, I noticed a temperature and wind change. Thinking we may get some rain we closed up the boat and turned on the radar. This was the first time I’d used this radar, but it showed the storms clearly and through a couple of course changes we were able to avoid getting wet. Next – about 7AM Sunday morning as we are motoring along the engine rpm fluctuate and then the engine quits. We were motoring because we wanted to go north and the wind was from the south, which generally a good thing but the winds were only 4-6 knots so it would have had us arriving after dark, something I didn’t want to do. When a diesel engine quits like that it is normally a fuel problem, so I check the fuel tank – plenty of fuel and then the fuel filter – no problems there either. At a loss as to what to do I decide to try to bleed the engine (purge it of any air in the lines) and see what happens. The first owner had added an electric fuel pump that is used to prime the system. All I had to do was turn it on and loosen some fittings in succession allowing the air out and then closing the fitting then turn off the pump. Soon the engine was running again but I didn’t know why it quit. Well about 5 minutes later the engine quits again. Since the fuel tanks and filters are ok I’m beginning to consider that the fuel lift pump may not be working. This is a mechanical pump on the side of the engine that moves the fuel from the tank to the engine. To test my theory I again turn on the electrical priming pump, bleed the engine and this time leave it on when I start the engine. Engine now runs fine, so it’s time to change the pump. Fortunately I have a spare pump, but changing it is one of those jobs that requires laying on the top of the engine, hanging over the edge and working upside down. So rather than waiting for the engine to cool and fixing it at sea we motored the last 25 miles with the electric pump running. So now the engine is running again we are closing in on Pensacola and the thunder storms are building. Time to close up the boat and turn on the radar. This time we weren’t able to dodge the rain, but we did manage to stay clear of the lightening. We arrive in Pensacola Sunday afternoon and I went to update the blog. I had turned off the computer when we were near the thunderstorms and now it wouldn’t boot up. After several attempts I called it quits and we went ashore for a drink and dinner. 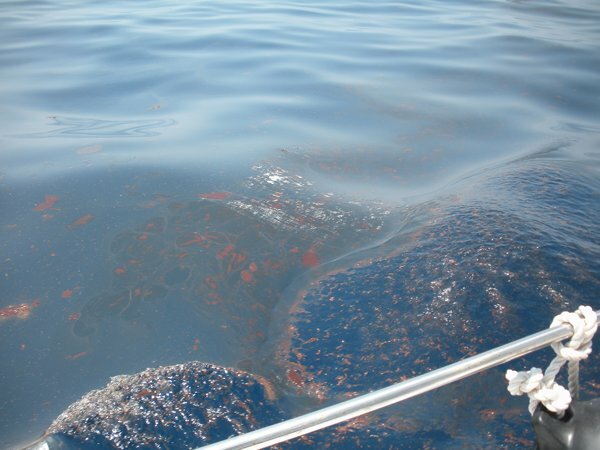 Here is a picture of the oil spill we went through. There was one section that we went through that was worse but it was not a solid layer of oil. The boat has a little oil around the bow but nothing major.